Since June 2012, all councils in NSW have aligned with the Integrated Planning and Reporting Framework embedded in the Local Government Act. The Integrated Planning and Reporting Framework allows us to draw our various plans together, identify synergies within our strategies and so plan holistically for the future of our City. 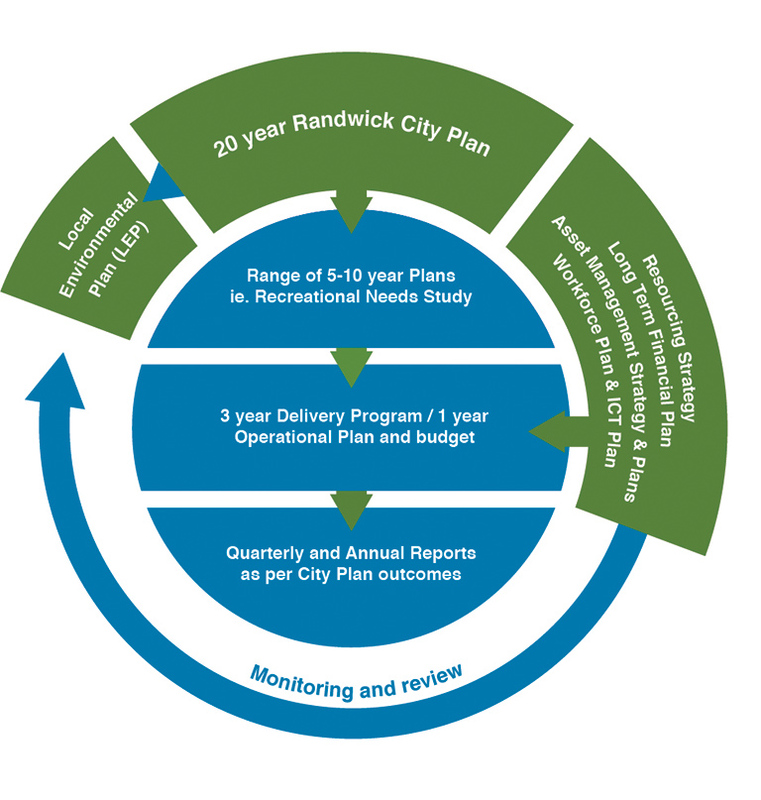 The Randwick City Council Integrated Planning and Reporting Framework comprises the 20-year Randwick City Plan; combined Delivery Program and Operational Plan; and Budget which are all supported by the Resourcing Strategy. Our Annual and Quarterly Reports are our progress tools against achieving the goals and aspirations of our community. The Randwick City Plan is a 20-year guide for future planning of our City. This Plan, first developed in 2006, is kept up-to-date by ongoing and close consultation with the community. This Plan not only identifies who we are and the community's priorities, but outlines a vision for the health and well being of our people, our economy and the natural and built environment. The Randwick City Plan is an overarching document underpinned by a suite of medium and long term plans and the Resourcing Strategy that explains how we will meet our obligations now and in the future, taking into account our workforce, our finances and our assets. This Plan belongs to our community. The Resourcing Strategy PDF, 517.67 KB is based around four interlinking plans: the Workforce Plan; the Digital Strategy and Asset Management Strategy. Together these plans provide a framework for allocating and prioritising resources to create outcomes in the City Plan and to plan our day to day operations. The Workforce Plan PDF, 1567.26 KB provides us with a framework to employ staff that can achieve our strategic directions, develop innovative solutions and deliver services and programs efficiently. The Long Term Financial Plan PDF, 2298.33 KB has a ten-year outlook which is updated twice a year. It enables us to better plan and understand our long term financial requirements and adapt to changing financial circumstances. The Digital Strategy PDF, 794.89 KB provides detail on council’s business systems and technology. It outlines the digital strategy and major project initiatives to help Randwick to become a smart city and Council be a leader in the delivery of services through digital channels. The annual Operational Plan is a document which sets out how Council are using the long term outcomes of the City Plan to create day to day improvements in the Randwick area. This Plan should be read in conjunction with the annual Budget which includes details of the capital works program Council has developed to create improved facilities, enhanced infrastructure and inviting spaces. As Randwick City Council is the guardian of Randwick City, we need to be accountable for our actions. Council updates the community about its progress on its specific projects and services every three months in Quarterly Performance Reports and its achievements over the year in its Annual Report. In each of these reports we measure our effectiveness through key performance indicators. Randwick City Council does not make its plans for the area in isolation. In developing a strategy for the future, Randwick City Council takes into consideration other broader plans such as NSW 2021, the 10 year State Plan and the Metropolitan Plan for Sydney 2036, and integrates them with key council documents such as the new Local Environmental Plan.